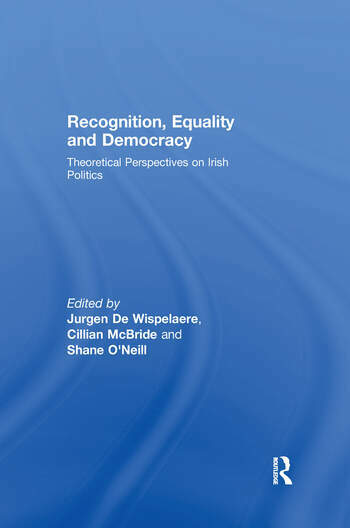 This volume brings together a range of theoretical responses to issues in Irish politics. Its organising ideas: recognition, equality, and democracy set the terms of political debate within both jurisdictions. For some, there are significant tensions between the grammar of recognition, concerned with esteem, respect and the symbolic aspects of social life, and the logic of equality, which is primarily concerned with the distribution of material resources and formal opportunities, while for others, tensions are produced rather by certain interpretations of these ideas while alternative readings may, by contrast, serve as the basis for a systematic account of social and political inequality. The essays in this collection will explore these interconnections with reference to the politics of Northern Ireland and the Republic. The Republic has gone through a period in which its constitution was the focus for a liberal politics aimed at securing personal autonomy, while Northern Ireland’s political landscape has been shaped by the problem of securing political autonomy and democratic legitimacy. While the papers address key questions facing each particular polity, the issues themselves have resonances for politics on each side of the border. Critical Theory and Ethno-National Conflict: Assessing Northern Ireland’s Peace Process as a Model of Conflict Resolution. Illegal in Ireland, Irish Illegals: Diaspora Nation as Racial State. Democratic Autonomy, Women’s Interests and Institutional Context. Comprehensive Liberalism and Civic Education in the Republic of Ireland. The Battle(s) Over Children’s Rights in the Irish Constitution. Disability Rights in Ireland: Chronicle of a Missed Opportunity. How to Think About Marriage: Autonomy, Equality, Recognition. The Regulation of Public Space in Northern Ireland. Identity, Unity, and the Limits of Democracy. Jurgen De Wispelaere lectures in political philosophy at the Dept. of Philosophy, Trinity College Dublin. Cillian McBride is a lecturer in political theory, at the School of Politics, International Studies, & Philosophy, Queen’s University Belfast. Shane O’ Neill is Professor of Political Theory, at the School of Politics, International Studies, & Philosophy, Queen’s University Belfast.